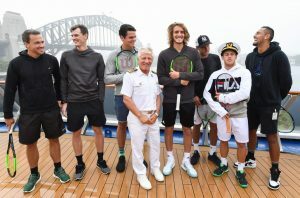 Some of the world’s top tennis players took time off the circuit to enjoy views of the iconic Sydney Harbour on board Carnival Spirit today. Captain Binacchi held court with Bruno Soares, Jamie Murray, Milos Raonic, Stefanos Tsitsipas, Lucas Pouille, Diego Schwartzman and Nick Kyrgios alongside The Hon. Adam Marshall MP, NSW Minister for Tourism and Major Events and The Hon. Stuart Ayres MP, NSW Minister for Sport, on board the ship showcasing the Opera House and Harbour Bridge as part of the announcement of the ATP Cup, which will debut in Australia in January 2020. In 2019, Carnival ships will sail over 150,000 guests out of Sydney Harbour, on 60 cruises, making this Carnival’s biggest year to date sailing from the stunning harbour city. Carnival Splendor will also join the Australian fleet in December 2019, sailing from her new home port of Sydney. She is set to become the newest and largest ship home ported year-round in Australia. With over 45 activities to enjoy each day, Carnival’s ships offer fun-loving families and couples lots of fun, memorable holidays at great value. All photos and B-roll are by James D Morgan.